Put the top and doors on. Finally found a tune that I am happy with... After a couple of days of working through the process have found a tune that I like. I must admit I was skeptical after I speaking with product support at Howard Cams as well as Mark with Split Second, but I am much more of a believer today. With about 50 miles on the tune so far this is what I have experienced - smoother idle, more "crisper" throttle response, a much smoother power band between 800 RPMs and 1,500 RPMs, and a reduced exhaust smell. My plan is to create a detail write up of the process with lessons learned then drop it in the Technical Discussion section for anyone that is interested in learning more about Piggyback Tuning. Golly it is starting to feel like fall, the leaves are starting to turn and Dain has put the hard top on the Scrambler. Haha. A little early this year due to my new parking for work and this weather. I try to hold off through October. I like driving around in the crisp fall air. But not to be done this year. Weather has been wacky. Had a learning experience. Popped off the caliper. Realized I need bigger wrenches for that job, the 18mm was too big and 3/4 in was too small but I was able to grab the nut with it enough to pull it off. So is that like 20mm? I believe the bolt was 15mm. Anyway, once I popped the caliper off I saw the inner pad was fine. So you can't actually see the inner pad when you pop the wheel off, oops. My brakes are fine and now I have a nice set of Hawk LTS pads I can use in probably another 20k miles or the way I drive my Jeep, 2-3 years from now. 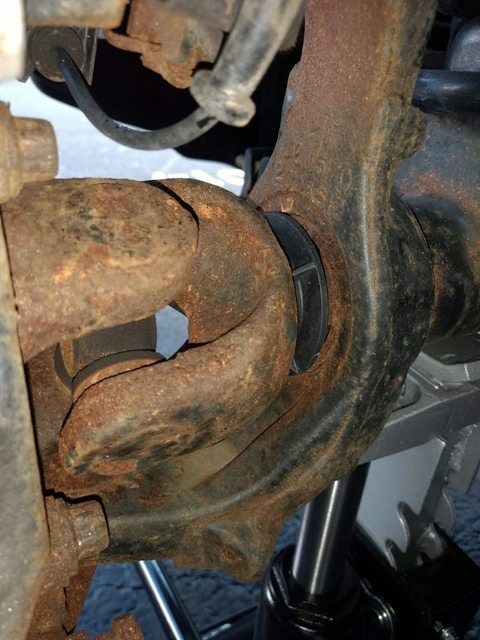 However, while I was in there, am I worried about this much rust in this location on a 2015 Jeep? This is behind the front wheel. My new tuffy center console came in yesterday and is all built to be installed. My trucklights came in today ready to be installed. Why am I not working on them right now? My jeep was left at my buddies during the truck work so I could take the truck home because the project ran over time I didn't have a second driver or the trailer. I got to use my powertank today to add air to the tires of the JKU. One tire has a pretty good leak so put the spare on. It was really low. So filled in in a few seconds then went around to make sure they were all good. Not the most adventurous use for the powertank, but quite handy. Thanks for the tire pressure end for the hose Stephen. Made it quicker not having to keep switching to a separate gauge. But how accurate is your gauge??? The gauge in the glove box and the TPMS were way diff. TPMS says 38 psi while the gauge read 32. - The Eagle Globe and Anchor - Semper Fidelis Anthony! Took the JKU to High Tech today to get my tail light issued diagnosed. I was thinking TIPM, but it turned out to be that the socket that the bulb plugs into was loose and the were some carbon deposits from the bad connection causing the whole thing to stop working. They informed me iI had a rear axle seal leaking and my brakes were near dead, so they did that too since I have inspection coming up in November. Also need to do shocks and service the diffs, so I will be looking into getting new diff covers when I do that. Ya know. Old man emu makes great shocks. Teraflex too. Metal cloak has a full system to replace shocks and everything else that's attached to it. I. Talking about a lift. Do it. It's time!!! Changed the gear oil on the front and rear differentials when I got off work. Back was kinda dirty but I don't see why the dealer called it out other than a money grab. Would call it a good learning experience but it was just plain easy. Replaced drive belt, idle pulley, and auto tensioner. This is the first item I've tackled from the list the shop identified. thanks to the information I've found on this and other jeep forums it went smoothly. I gotta say I really appreciate the jeep community. next is either oxygen sensors or radiator. 1. replace a/c compressor, dryer and a/c liquid line. evacuate and recharge system.